This view is an enlargement of an image of NASA's Mars Odyssey spacecraft taken by the Mars Orbiter Camera aboard NASA's Mars Global Surveyor while the two spacecraft were about 90 kilometers (56 miles) apart. 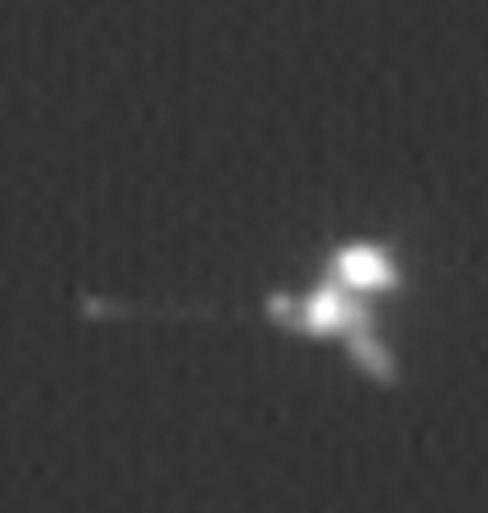 The camera's successful imaging of Odyssey and of the European Space Agency's Mars Express in April 2005 produced the first pictures of any spacecraft orbiting Mars taken by another spacecraft orbiting Mars. 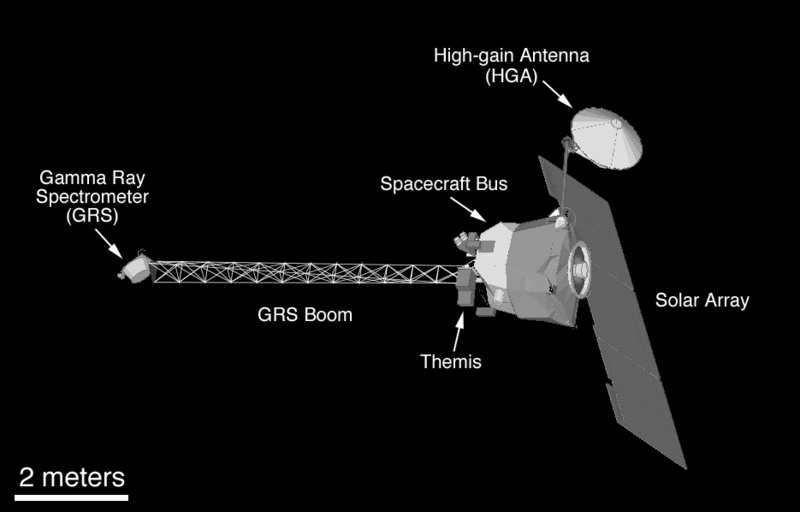 Mars Global Surveyor and Mars Odyssey are both in nearly circular, near-polar orbits. Odyssey is in an orbit slightly higher than that of Global Surveyor in order to preclude the possibility of a collision. However, the two spacecraft occasionally come as close together as 15 kilometers (9 miles). The Mars Orbiter Camera can resolve features on the surface of Mars as small as a few meters or yards across from Mars Global Surveyor's orbital altitude of 350 to 405 kilometers (217 to 252 miles). From a distance of 100 kilometers (62 miles), the camera would be able to resolve features substantially smaller than 1 meter or yard across. 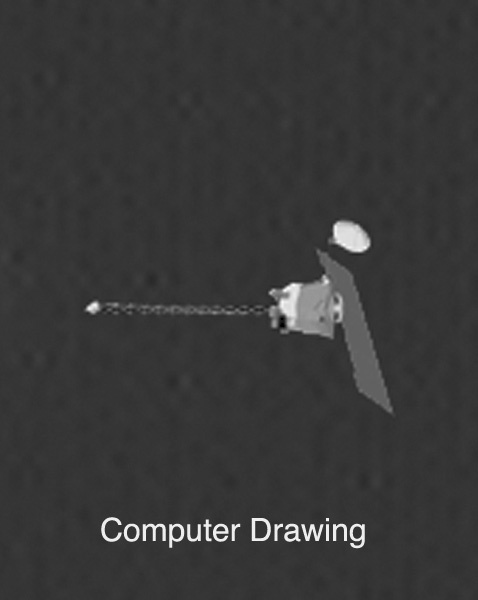 The components of Mars Odyssey when viewed from the same angle as this image can be seen in a computer drawing and an annotated computer drawing, of Odyssey. Mars Odyssey was launched on April 7, 2001, and reached Mars on Oct. 24, 2001. Mars Global Surveyor left Earth on Nov. 7, 1996, and arrived in Mars orbit on Sept. 12, 1997. Both orbiters are in an extended mission phase, both have relayed data from the Mars Exploration Rovers, and both are continuing to return exciting new results from Mars. JPL, a division of the California Institute of Technology, Pasadena, manages both missions for NASA's Science Mission Directorate, Washington, D.C.